The Junkers EF.130 was designed at the same time as the Ju EF.128. 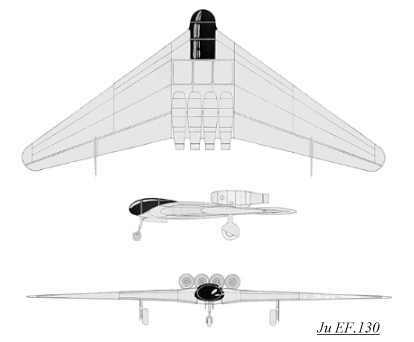 This flying wing design was powered by four BMW 003 turbojets mounted side-by-side above the ventral trailing wing edge. The construction was to be of metal, with wooden outer wing sections. A small glazed pressurized cockpit was located in the extreme nose for a two or three man crew. Landing gear was to be of a retractable tricycle arrangement, and no defensive armament was known to have been fitted. A bomb load of 2950 kg (6490 lbs) was to be carried.